I so excited to continue the collaboration with my colleague, Carmen Fernandez. 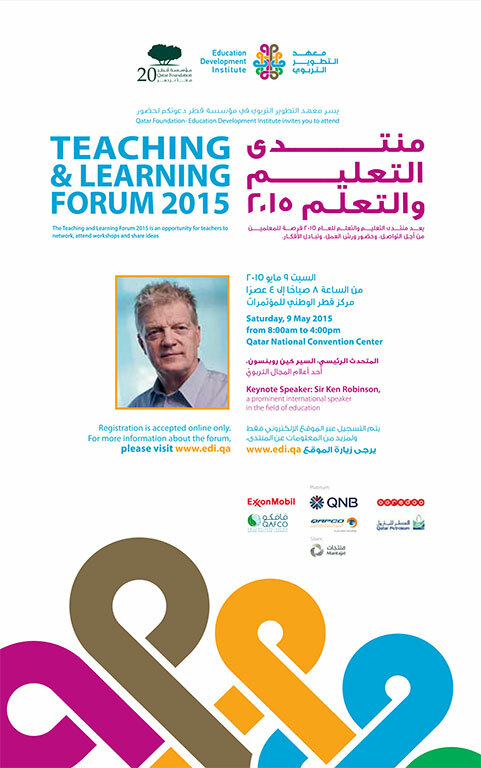 This time we will present together at the Teaching and Learning Forum, hosted at Qatar National Convention Centre. Our presentation – Digital Technology Tools and Strategies – is scheduled to start at 2.00 PM. Keynote speech by Sir Ken Robinson. I am very honored and happy to have this article published in the IB Community Blog. This is the result of a fantastic collaborative work with my students, teachers, teacher assistants and a very supportive PYP Coordinator. The use QR codes with KG students in a stand-alone Adventure Challenge unit in Physical Education is a breakthrough experience at such age and I am very proud of their achievements. They were able to scan codes, play a movie and perform the exercise shown in the movie. All of this was part of a scavenger hunt which was meaningful and fun for them. They learned how to cooperate in a team, share the same goal and use technology while still performing various physical activities. I thought I should celebrate my award with a quick reflection about the steps that brought me here. 2012 I receive an e-mail from a colleague and I sign up for a PE technology based workshop in Dubai. I have no clue about technology in PE but this looks interesting. I buy an iPad and tomorrow I travel to Dubai. Still figuring out the basic functions of my new gadget. The workshop is led by Jarrod Robinson. Now understand why he calls himself The PE Geek. I am blown away about the amount of innovative skills and strategies he uses to improve learning. Back to school with no Wi-Fi network. The challenge starts here. Celebrating my successes and failures becomes a new way of improving myself. I am introducing various tools in the planning process as well as new assessment strategies. It is hard to share my work with the students and parents so I design a website, on a free platform but with limited space to use. I am in a brand new school and the Wi-Fi is covering even the outdoor courts. 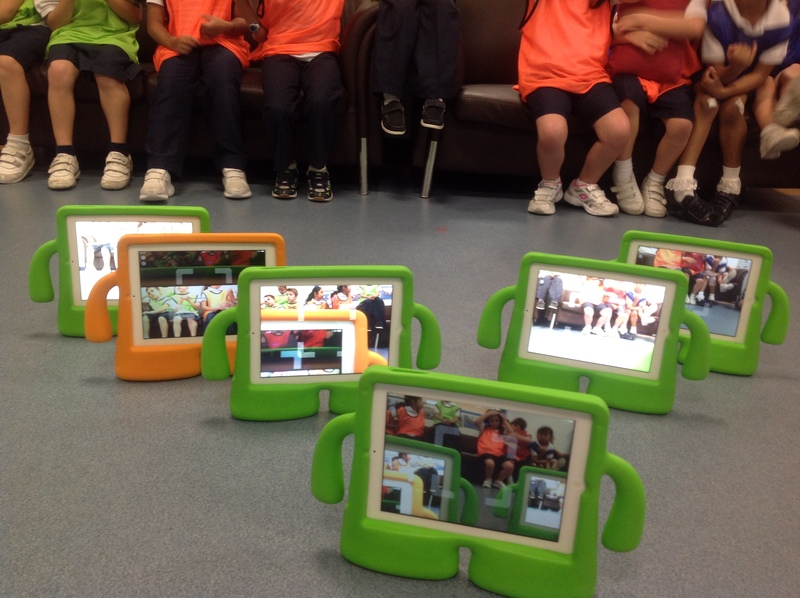 I introduce iPads in the PE lessons in the Early Years. My students are scanning QR codes and they participate with their own reflection during the individual video analysis assessment in the Adventure Challenge unit. We are creating resources (videos, digital portfolios, assessments) and the feedback from students and parents is enthusiastic. Signing up for a life membership and mentorship at www.thepegeek.com. I am attending webinars and online courses on how mobile technology can be integrated in the PE lesson. My first presentation at the Qatar National Convention Center during the Education Forum, April 2014. I share successful practices with my colleagues from all around the country. My first PD session with the school staff, presenting various digital tools and strategies to improve learning. October 2014. 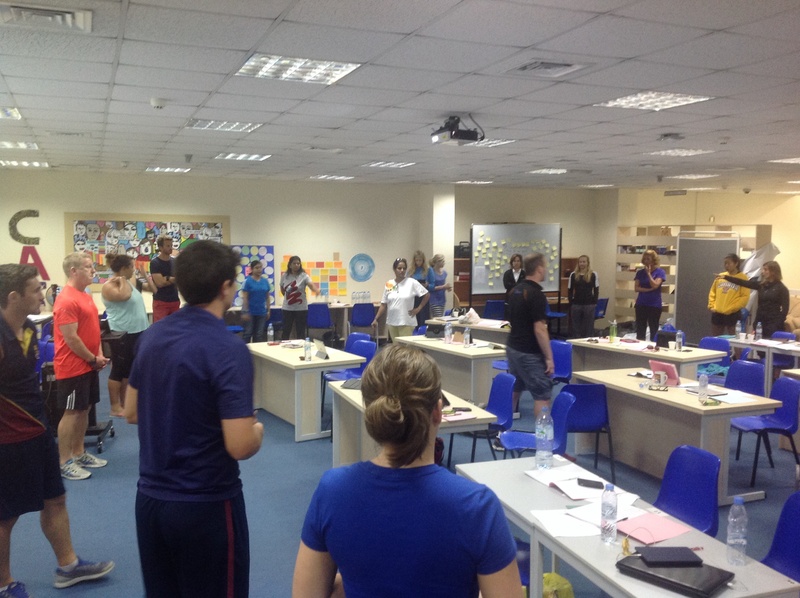 After two years it is time for another PE Geek workshop, in Dubai. Great experience and a good chance to connect with other educators. November 2014. 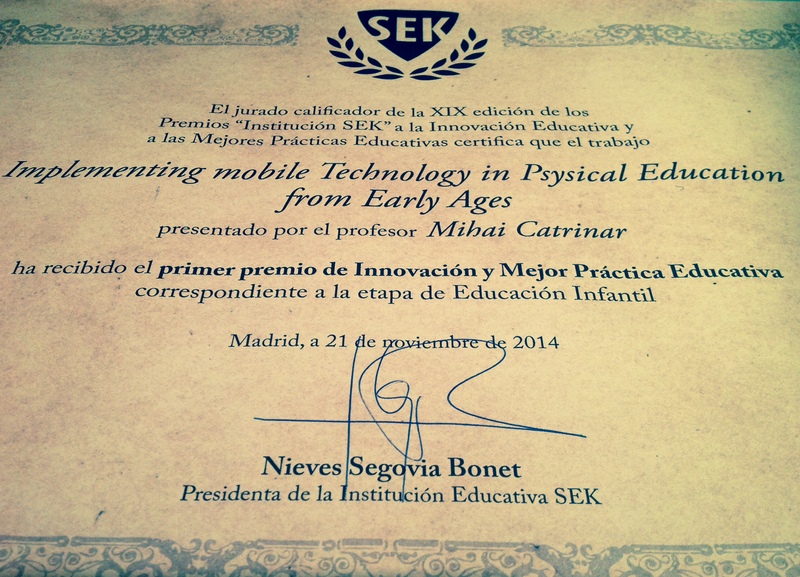 I am awarded for The Best Work of Educational Innovation and Best Educational Practice in Preschool, among all SEK schools from Spain, France, Ireland and Qatar. I guess my Christmas gift arrives earlier this year. I am already lucky to be awarded by my students on daily basis. They ask questions, they are not shy to express what they like or don’t like about what we do. We experience a climate filled with their creativity, enthusiasm and energy. Their knowledge is an inspiration for me. This special award is topping up the daily reward I get from my students. This is why each and one of us is still in this game. It is the game of change. We influence them, inspire them and shape a future that we’ll probably not even see.